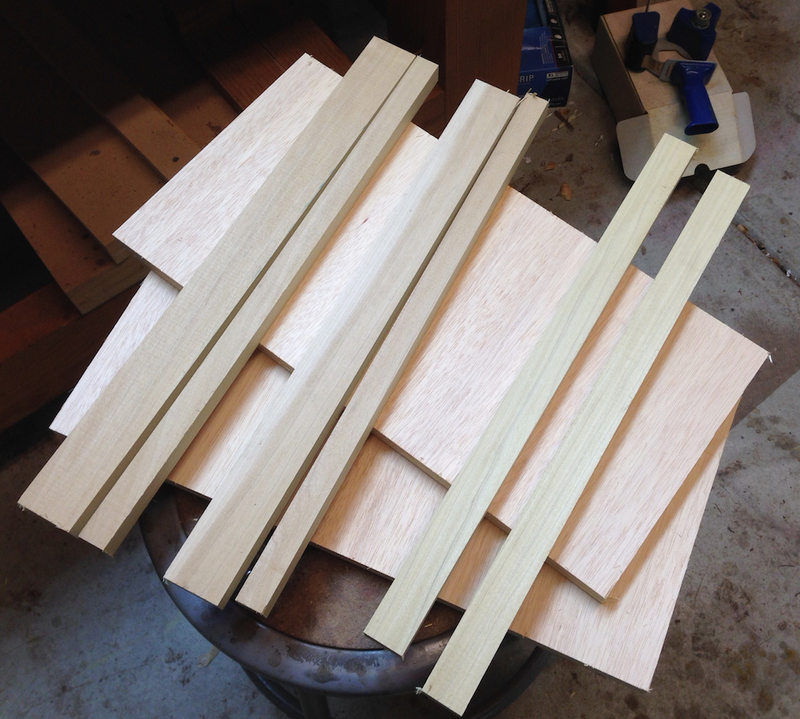 Yesterday I left off with pictures of the freshly slotted saw handles. It’s always a great confidence booster when something I was worrying about goes well. Luckily, there is always something else waiting in the wings to keep hubris and humility balanced. 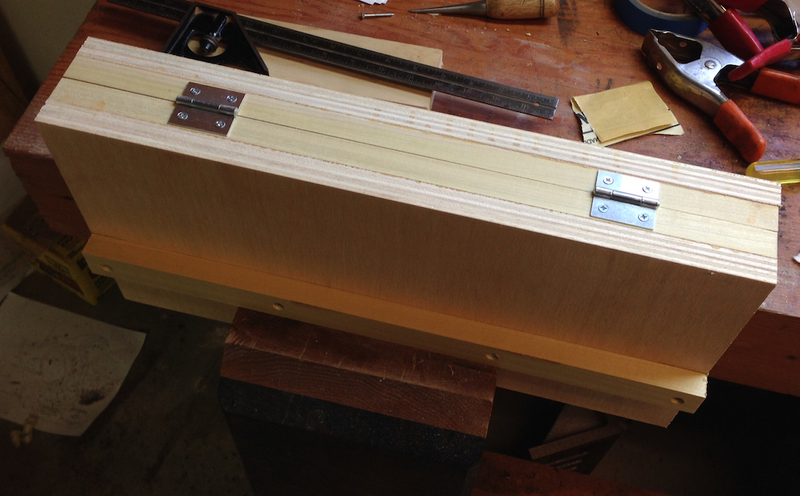 After several cups of coffee I went out to the shop yesterday morning and started laying out the mortise for the saw back. I assembled the saw plate and bronze bace and fit it to the handle so I could scribe the layout directly from the bronze back. 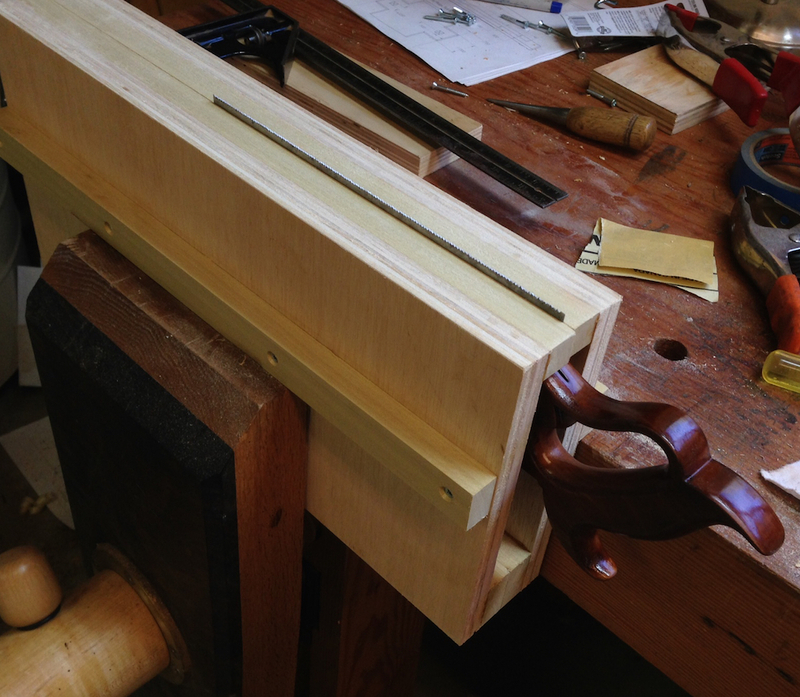 Transfer the location of the brass back to the handle. Yes, that’s the marking knife I made with the “surgical blade” recently. I need to make another, I really like this one. 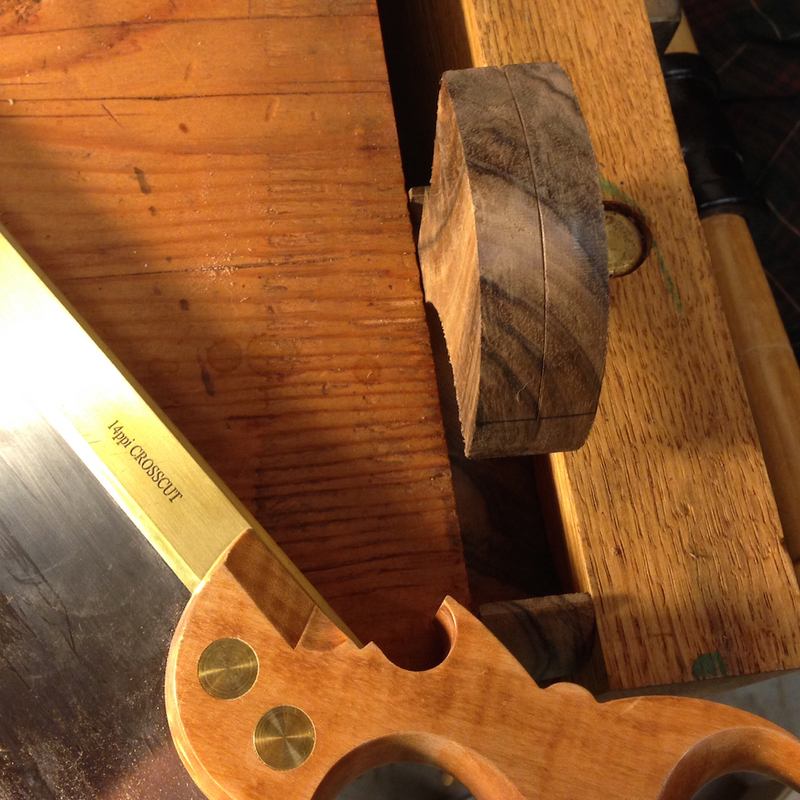 On the first handle I decided to chop the mortise just like I would for a piece of furniture. It was going just fine, but when I loosened the vise to reposition the handle, guess what I found? Yes, a little bit of humility there on the Group B Bench. First handle cracked even though it was supported in the vise. Bummer, right? 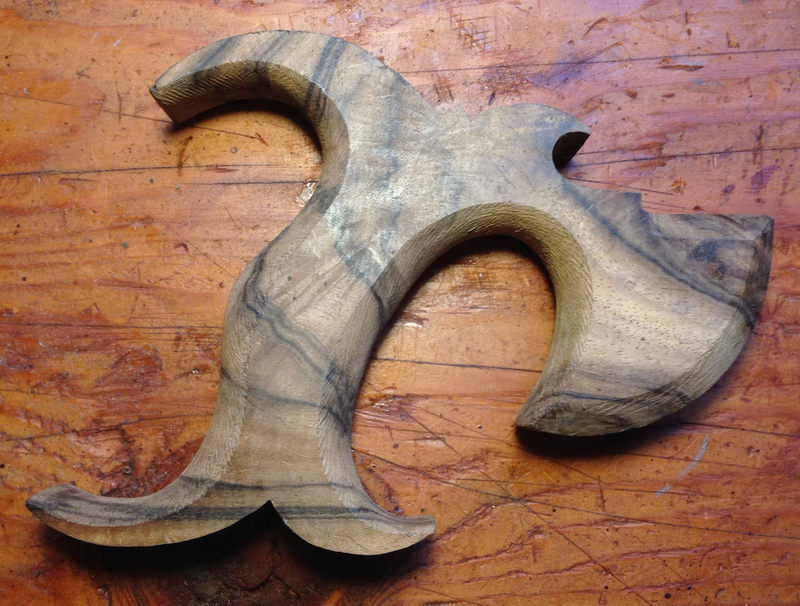 I’ve had this happen before with figured Claro Walnut, there was a great bit of curly figure in this piece too (obscured by the coarse sanding). Unfortunately that also made the grain run vertically right in this spot. Oh well, better now than after the saw was done. 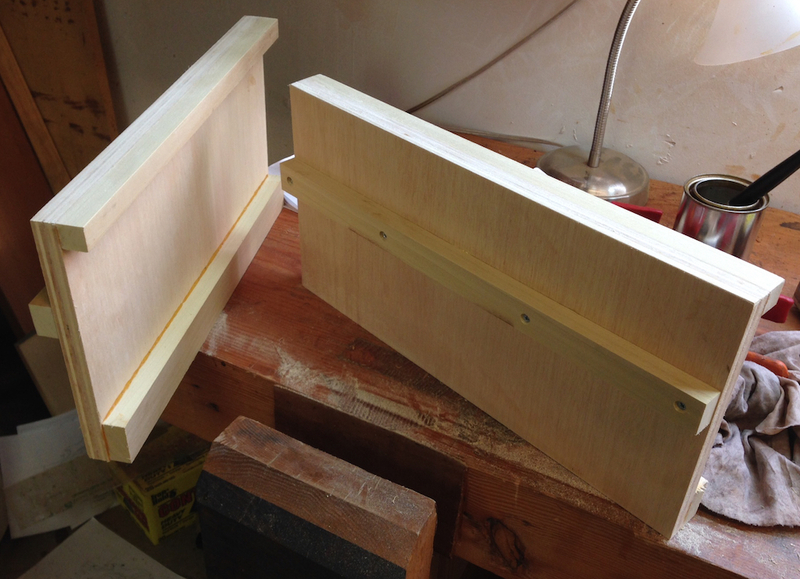 For the second attempt I decided to try sawing the sides of the mortise, sort of like you would on half-blind dovetails. That worked OK, but I’d be lying if I wasn’t wincing with every move of the chisel. But it worked just fine. With the mortise done I clipped the back of the saw plate so it would seat against the kerf in the handle and test assembled the saw. It’s an OK fit, I’ll give it a B+ for accuracy and class participation. The overall look of the saw is good. I’ll need to trim the brass back just a bit. 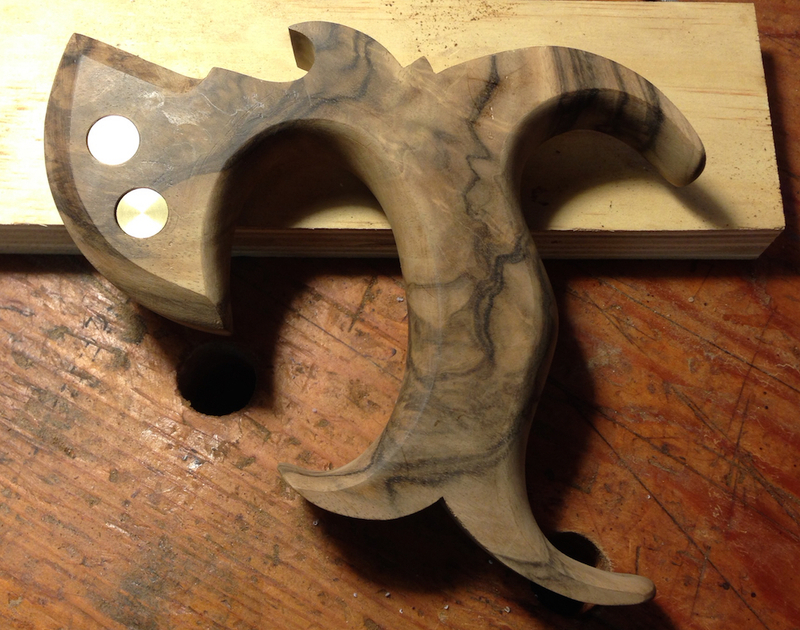 With that done I was ready to start shaping the handle. I drew layout lines on the side as you can see in the picture, and on the edges. The lines on the edges are parallel to the sides and about 3/16 away. I also drew in a center line on the edges of the handle. 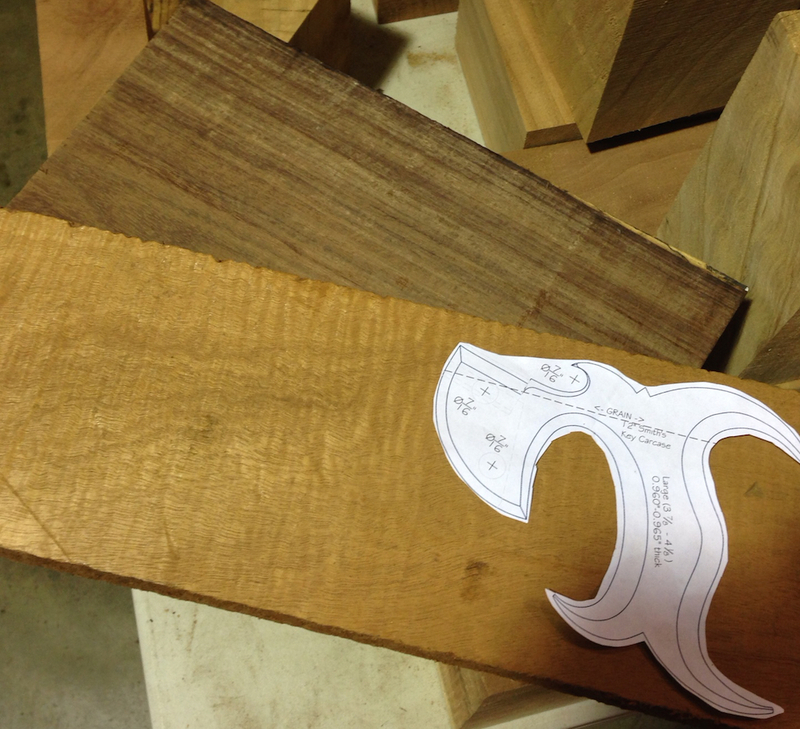 The first step in shaping was to rasp a bevel from the layout line on the side to the line on the edge. I tried to get a flat chamfer and to keep an “even” edge where the shaped area meets the side of the handle. 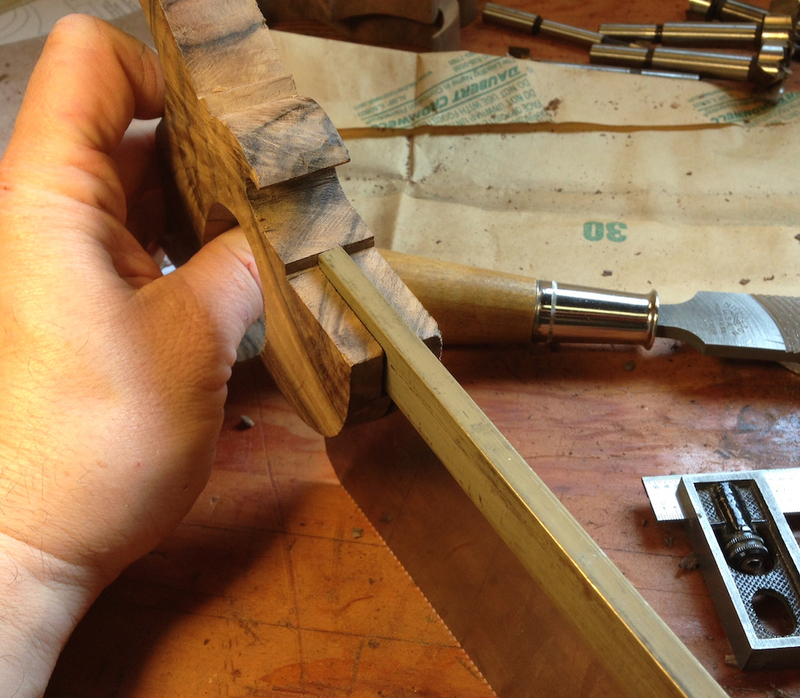 Once I had the primary bevels cut into the handle area on both sides, and on the front and back of the handle, I was ready for the next step. 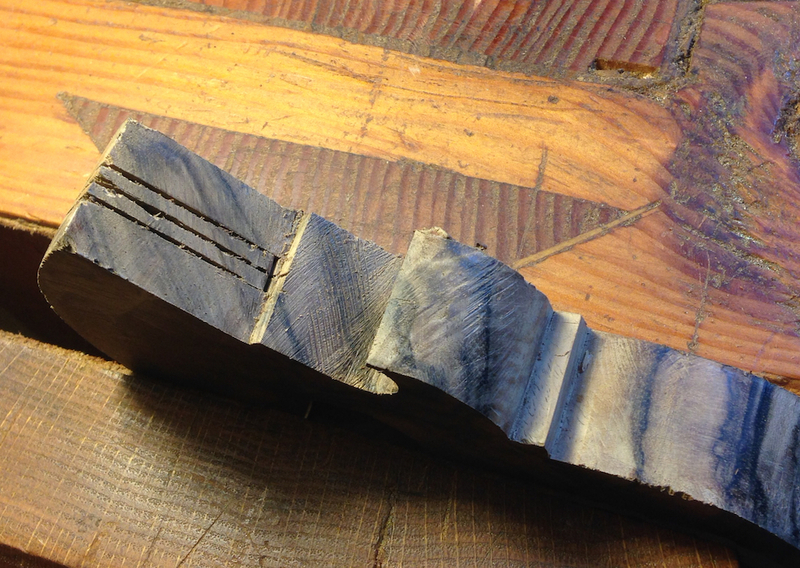 I laid out a line in the middle of each bevel and rasped a second bevel from the line to the center line of the handle edge. 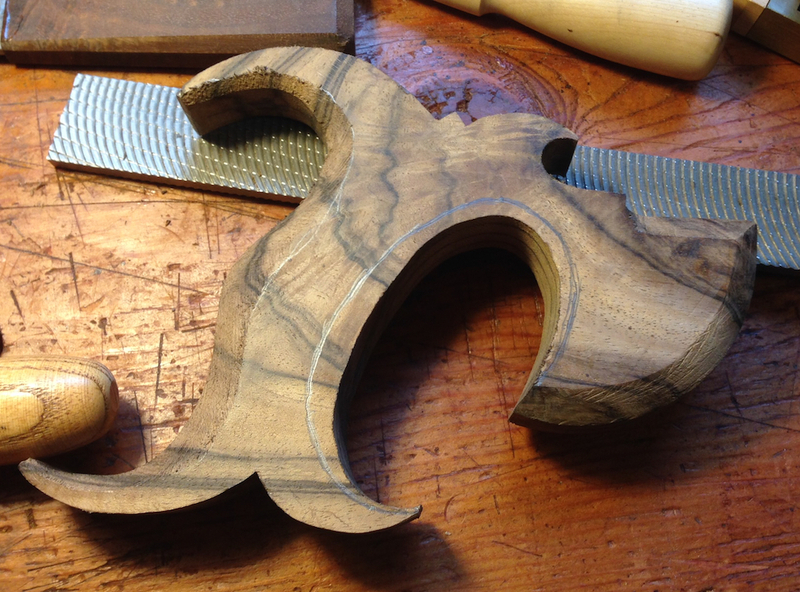 From there it was simple to round over the remaining facets to have an even shape. 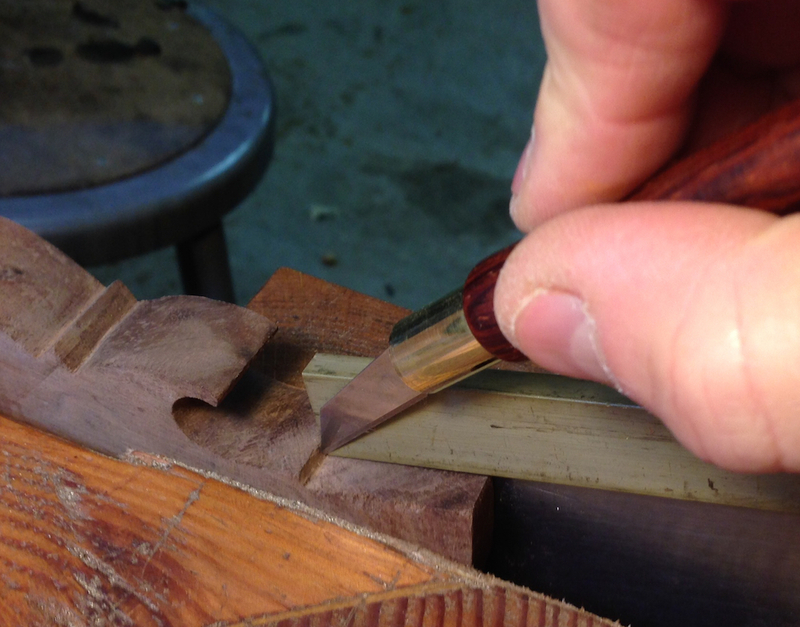 By cutting a series of even facets you can ensure that the shape will be even more easily than just grabbing a rasp and rounding it over from the start. 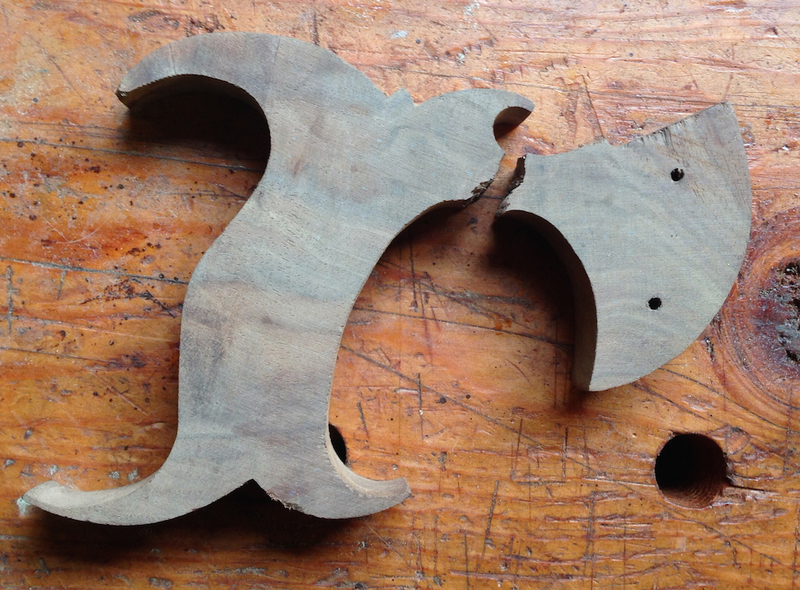 Blackburn Tools has a great series of articles that describes the process in more detail, including some details I’m not going to incorporate on this saw — maybe on the next one. 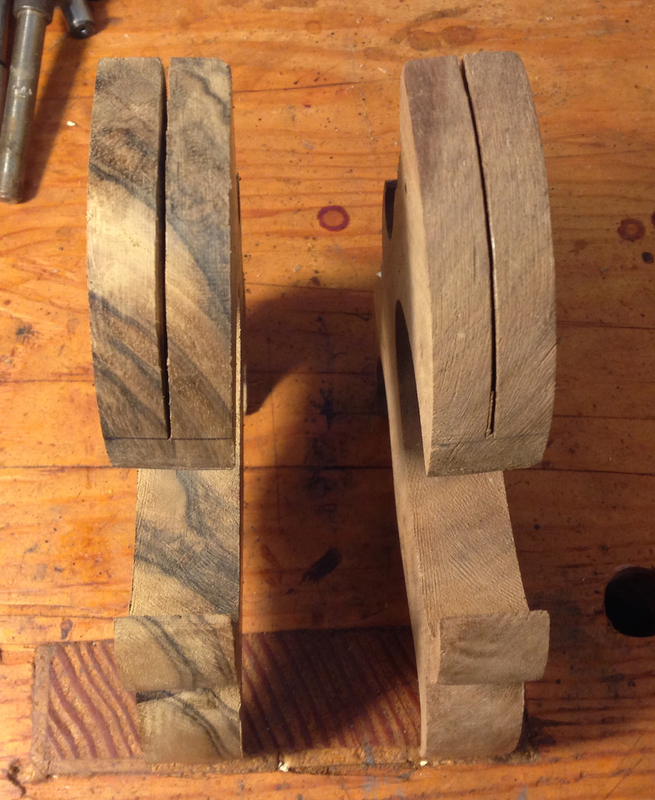 Both bevels cut and blended together, Lots of sanding to go. 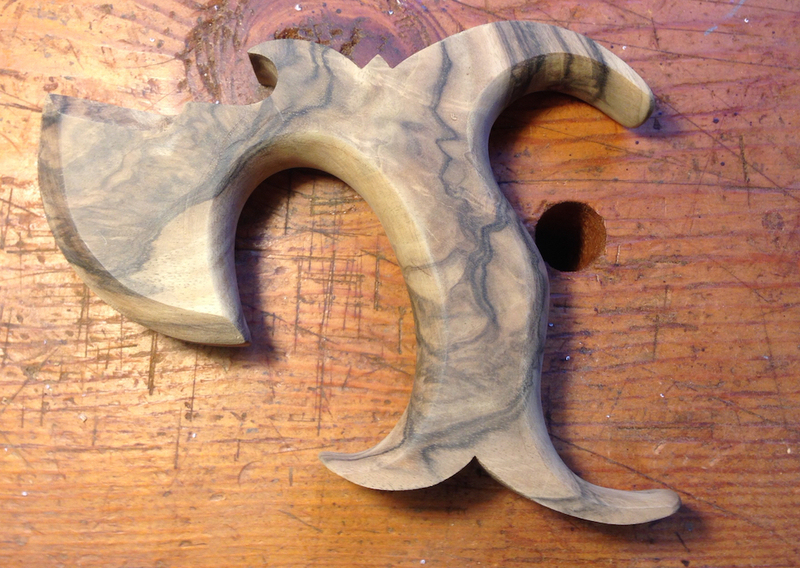 The rough shaping of the rounded part of the handle went really quickly. Maybe 10 minutes. This was followed by an hour or more of hand sanding the rounded areas to remove the rasp marks and smooth everything out. I started with 100 grit, then 120, 150, 180, 220 and 320. The hardest part for me are the chamfers y the saw plate. They aren’t as uniform and flat as I’d like. I’ll need to work on my technique. I drilled the handle for the saw nuts, drilled the saw plate to match and started working on the saw back and saw plate. 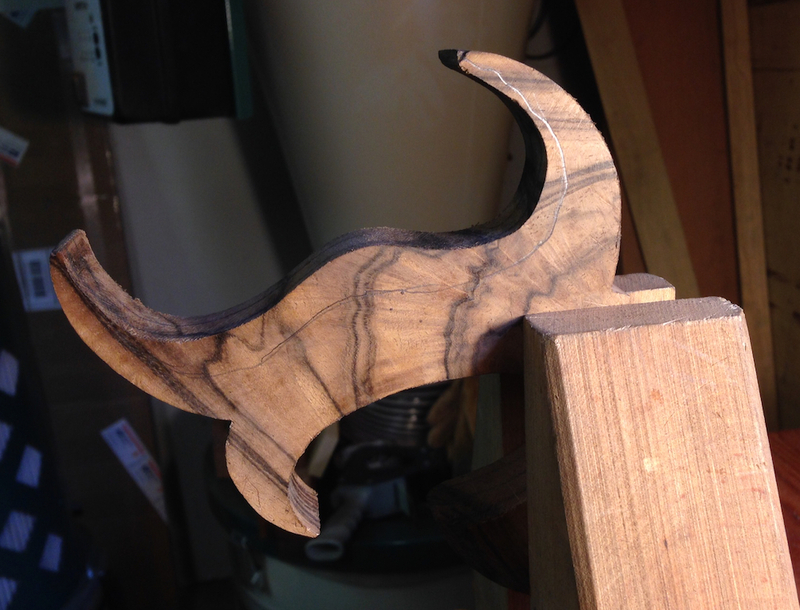 I got one coat of shellac on the handle and left it to dry overnight. I’ll sand it today and work a couple of more coats on. I need to set and sharpen the saw and assemble it but I think I’m pretty close.